What is an EMV Chip Card and How Secure are They? When was the last time you actually swiped the stripe on your credit or debit card during a transaction? If it’s been a year or so, the timing sounds right. Over the past 12 months, there’s been a huge technological shift from mag-stripe cards to those enabled with chips. In fact, chip-enabled cards represent more than 600 million cards in the U.S. alone. In spite of retailers in the U.S. being slow to embrace the new technology (in Europe and other parts of the world, retailers have by and large already adopted chip cards), you’ve likely seen merchants upgrading or replacing payment terminals to accept chip cards. While this takes place, magnetic stripes will continue to go the way of the dodo. Even if your old card hasn’t expired yet, your bank has probably already provided you with a chip-based replacement. This migration to chips cards, also known in the industry as EMV (Europay, MasterCard, Visa) credit cards, is accompanied by a swirl of hype. For example, EMV providers commonly state that your transactions are more secure, resistant to hackers, and foolproof to fraud. About now you may be wondering: How does that little microchip inside your card provide you with these safety measures? Read on to learn more about the EMV cards and how you can protect your money. Magnetic stripe technology is actually quite archaic. It dates back about 50 years and utilizes the same analog format as an old cassette tape. It’s literally magnetized and matched to your bank account information. This data, embedded on a simple mag stripe, is consistent and therefore never changes. So, anytime you go to swipe a stripe-equipped card, it reads the same data over and over again. And this consistent information is vulnerable to fraudulent activity because thieves can decode the magnetic field and duplicate your bank information. In fact, fraudsters commonly use credit card skimmers at ATMs and other locations to glean your personal information. Stopping fraud meant canceling your old card and getting a new one with new information. Unfortunately, your new card included the same stripe technology and it was therefore just as sensitive to theft as it was before. By contrast, the computer chip on an EMV card is where your banking information is stored, and the chip is always changing up the data on your card. For example, you may have a card number that stays the same, but the information embedded on the chip is constantly being scrambled and encrypted. In short, your card’s chip contains a special microprocessor that creates a code for every transaction, no matter the amount. The EMV chip also ensures that both the transaction and the cardholder are verifiable (before the days of EMV cards, you’d accomplish this by entering your PIN number and card’s security code). Essentially, your EMV card contains the exact same information as your old mag stripe card, but because the chip inside is always generating new coded information, it has an extra layer of protection that magnetic stripe technology fails to offer. For example, if a thief gets his hands on your EMV card, he will have a tough time using it. Not only is it difficult to obtain the computer chip from your card (equipment to do this can cost upwards of $1 million), but the advanced encryption would make it nearly impossible to decipher your banking information. Even if your card number was stolen, and not your actual card, the would-be fraudster wouldn’t be able to use it because EMV chip technology prevents the number from being replicated and repeated. On top of this, a payment terminal won’t recognize the number and the transaction will be declined. Keep track of your bank statements: Banks are more vigilant today to stopping theft and may even intercept fraudulent activity before it happens. My bank, for example, recently notified me that there was an attempted unauthorized use of my debit card – before a transaction was made. But, thanks to my EMV card, the fraudster couldn’t use my card number, and the bank recognized that I wasn’t the one using the card. The moral here: Stay on top of your monthly bank statements and look for transactions, debits or withdrawals that don’t look familiar. If you spot anything suspicious, report it to your financial institution. 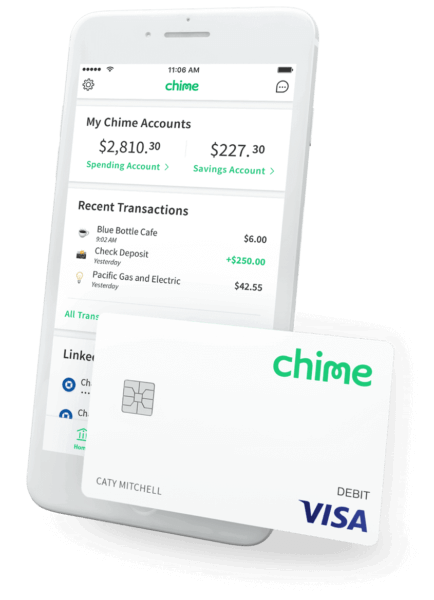 Opt for mobile payments: Chime’s spending and automatic savings accounts are just two ways to maximize your mobile banking experience without the need to use a physical debit card. To ensure your safety, you can also look for retailers and vendors with mobile payment technology as this lowers the risk of your information being captured. Adding your debit and credit cards to your phone and using mobile-enabled terminals can also help ensure a secure shopping experience.